Ammonium Chloride (Sal Ammoniac) is often used in the recovery process of platinum metal (Pt) from catalytic converters. It is combined with water and used as a wash solution to precipitate scrap Pt dissolved in an aqua regia solution. Also useful in creating colored patinas on metal, especially copper, brass, and bronze. 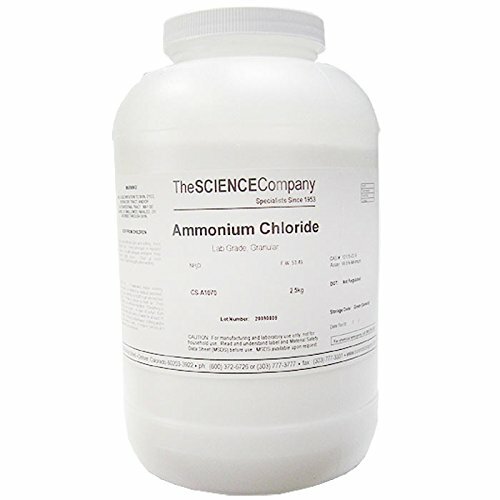 It is a clear white, granular, water-soluble crystalline salt of ammonia. If you have any questions about this product by The Science Company®, contact us by completing and submitting the form below. If you are looking for a specif part number, please include it with your message.